Phoenix, AZ (Nov. 9, 2018)— Earlier this year, NASCAR driver and 2018 Richtopia Top 100 Philanthropist, Brad Keselowski, announced his Checkered Flag Foundation would support Paralyzed Veterans of America’s employment program, PAVE (Paving Access for Veterans Employment). 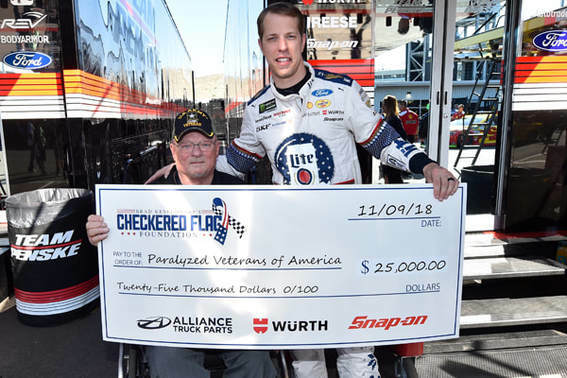 Team Penske partners’ Alliance Truck Parts, Snap-On and Würth have also joined these efforts, and today Keselowski presented a check for $25,000 to Bill Lawson, former president of Paralyzed Veterans of America. Started in 2007, the PAVE program provides career assistance and vocational support to transitioning service members, veterans, military spouses, and caregivers across the country. Through the PAVE program, clients receive high-touch engagement as they look for meaningful employment. PAVE staff work with members of the veteran community to provide one-on-one support with resume development, sharpen interviewing and networking skills, and build a strong LinkedIn profile.PAVE operates through eight locations nationwide and in 2018, PAVE staff has placed 319individuals with meaningful employment opportunities. Paralyzed Veterans of America not only supports disabled veterans, but all veterans. The organization advocates for quality health care and governmentalbenefits on behalf of veterans who have rightfully earned them. In addition, the organization is also a champion in fighting for job opportunities for veterans.